We previously reported that OnePlus is gearing up to launch its next flagship smartphone series, which will be called as OnePlus 7, by next month. It is speculated that the Chinese phone maker will be launching three smartphones this year unlike every other year. We already know that OnePlus will be launching the 5G version this year, which has been confirmed by the company. Though the company will be launching its first 5G smartphone in India, it is rumoured that OnePlus will also be introducing OnePlus 7 and OnePlus 7 Pro. 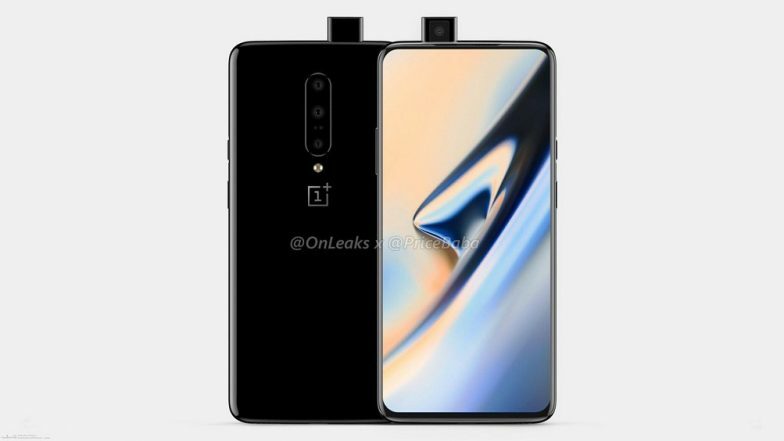 Amidst of the rumours, a new images has leaked on the internet claiming that OnePlus' 2019 smartphones .i.e. OnePlus 7 and OnePlus 7 Pro will be launched globally on May 14. Google Pixel 3 & OnePlus 6T Phones Attracted Samsung's One-Third Users in US During Q4 2018. It is important to note that there is no official date confirmed for the launch of OnePlus 7 series as of now. So, it is advised that this piece of information should be taken with a pinch of salt. Talking about the leaked image, the OnePlus 7 Series phones will come with a tagline of 'Go Beyond Speed'. Recently, OnePlus 7 Pro images were leaked online, which revealed some key specifications and features. The images confirmed notch-less and bezel-less design on OnePlus 7 Pro which reportedly became possible because of the pop-up selfie camera. Now, we have already seen some smartphones with pop-up technology such as Vivo V15 Pro and Oppo F11 Pro. OnePlus 7 Pro With Curved OLED Screen Leaked Online Ahead of Launch. Coming to the hardware aspect, OnePlus 7 Pro will be powered by Qualcomm's latest processor - Snapdragon 855 SoC, which is also seen on Galaxy S10 series and Huawei P30 Pro. The chipset will be coupled with 8GB of RAM and up to 256GB of internal storage. The phone will sport a 6.67-inch Super optic AMOLED display and will run the latest version of Android 9 Pie based on OxygenOS. For photography, the handset will be packed with a triple rear camera setup comprising of 48MP + 16MP + 8MP sensors. However, the specifications of the front camera are not known yet. More details and specifications are expected to be revealed soon. Going by OnePlus' previous trends, we can expect OnePlus 7 and OnePlus 7 Pro India debut immediately after the global as India is an important market for the phone maker. However, the company is yet to confirm the launch date of OnePlus 7 Pro and OnePlus 7.